CrowdHack - results are in! These guys hacked an Android app that took advantage of the barometer on some of the latest Android devices to crowdsource pressure readings and visualize everything in real-time on a map at http://weathermappr.com. Their app will basically turn millions android phones into weather stations that ultimately could predict the weather unlike it has ever been possible! 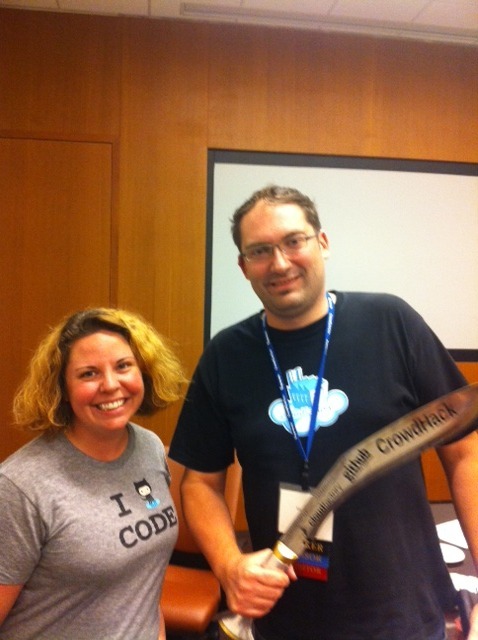 Congrats to Brendan Gill and Sina Khanifar who took home the massive CrowdHack Khukuri knife and free GitHub accounts + t-shirts. This is a photo of Mark from CloudFactory and Kami from GitHub right before they went on stage to present the winners with the unique prize. Tim Olsen is no stranger to crowdsourcing as he presented a paper on business process workflows using crowdsourcing at CrowdConf. But before he mingled at the fancy cocktail reception on Nov 2nd he was up late Nov 1st at CrowdHack trying to clean up India. Yep, that is right, Tim used CloudFactory to commission people in India to leave their computers to go out and clean up a street or park in their neighborhood. They had to show a before and after photo in order to complete the task and get paid. John Le and Dave Oleson created a hack that allows users to upload images of any moles or growths they have to check for malignancy. It then sends the images to the crowd, where they have workers assess the mole's asymmetry, borders, and color, which are standard attributes used for diagnosing malignant tumors. The crowd's assessment is then fed back into their application, and if there is any possibility of malignancy, the user is instructed to seek a doctor's opinion. They got extra points for the melaKNOWma name hack and we are still waiting to hear back how the crowd did with their diagnosing. Late in the event Arran Bardige sat down with some CloudFactory guys and started joking about calling Subway (as in the submarine sandwich chain that saved Jared's life) with a Twilio Robot to see if they would be a good fit to propose to his vegetarian girlfriend. It ended up with an assembly line that called a dozen restaurants in the area using the new Twilio CallerRobot at CloudFactory. Whoever picked up the phone was asked if it had a romantic setting, took reservations and what their best vegetarian dish was. The message left after the beep was then sent to cloud workers that listened to the wav file and filled out a form to produce enhanced business listings. That is the fancy way to say we hacked something that simultaneously prank called a bunch of restaurants (there may or may not have been some expletives recorded after the beep...). And that is the wrap on CrowdHack. Crowdsourcing and hacking go together perfectly and we look forward to a bigger and better hackathon next year. First lesson learned - don't use a conference center that won't allow us to have an open registration and order food according to who just shows up that day.